New clients sometimes arrive into my clinic wearing a lumbar support belt and 90% of them leave their first session without them! Lumbar support belts are frequently worn by low back pain suffers, but in my opinion they are often over used or misused. Many users report that they get a lot of psychological confidence when they wear their support. Others claim that it reduces their pain, and the remainder claim it reduces the fear of their back collapsing or giving way - like an insurance policy! I do see the value in them, particularly on the confidence aspect, and all these claims are true to some extent or another. However, the effect of wearing a lumbar support belt can be quite negative for your back! When lifting weights (for working out or just work!) - and using a correct lifting technique. In all other mechanical lower back pain I consider lumbar support belts to do more harm than good when over-used. The reason for this is that if your lower back is compressed and supported for too long - the muscles underneath it get lazy. Over time, this may lead to muscle weakness and further lower back problems related to this weakness. Excessive wearing of your lumbar support belt may also affect the muscles above and below where it is supporting. They may become too active or overworked. They may also be asked to work in a manner in which they were not designed to do. Over time, this may cause further problems in your spine in areas where you had no problems originally. To summarise for you, I use lumbar support belts on my clients infrequently and with extreme care and consideration. However, there is a time and place for their effective use, but only after a thorough examination and assessment from a doctor and chartered physiotherapist. 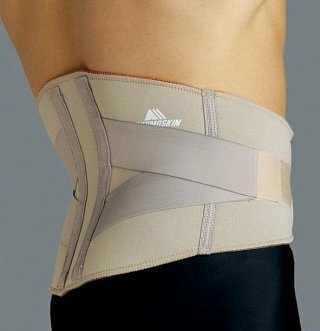 Never wear a lumbar support belt for longer than 3 days without absolute need.